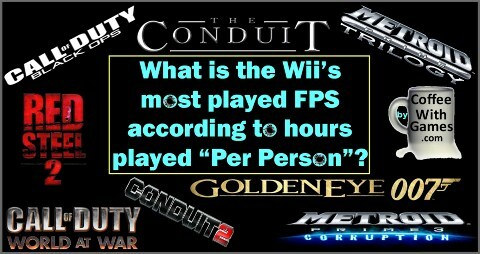 Earlier this week we looked at the Wii's most played FPS game according to the "Total Hours" played, as reported through the Nintendo Channel; you can read that report HERE. This FPS Black Friday report though, takes a look at the reported game-play data for Call of Duty: Black Ops over the last year. Call of Duty: Black Ops was released on November 9, 2010. It was developed by Treyarch, as was World at War, and published by Activision. The game received a "Mature" rating from the ESRB with "Blood and Gore, Intense Violence, Strong Language" listed as content for parents and gamers to be aware of. While Black Ops does not have the most "Total Hours" reported, it has become the Wii's most played FPS game "Per person" according to reported data. How many hours have Wii owners spent playing Call of Duty: Black Ops over the last year, with 377 days possibly reported? Let's take a look! Call of Duty: Black Ops now has 134,161 Wii owners that have reported game-play hours through the Nintendo Channel, which is an increase of 25,176 Wii owners having reported data since August of this year. Black Ops' average play-time per day/session reported for Wii owners is now 2 Hours 44 Minutes. This simply means that each day/session Wii owners are sitting down to play Call of Duty: Black Ops, they are investing nearly three hours of their time in the game. The 10,511,714 "Total Hours" reported is equivalent to playing the game for 1,199 years. Nonstop, FPS action, 24/7/365 for basically 1,200 years. Do we have any volunteers? The Wii version of Black Ops released with a MSRP of $49.99, but can be found on sale at different retailers depending when you look. I completed the single-player campaign in Black Ops earlier this year, as part of my New Year's video game resolution, but I haven't really played the game since. Like each Call of Duty game released for the last several years, Black Ops is still selling well considering it was released over a year ago. 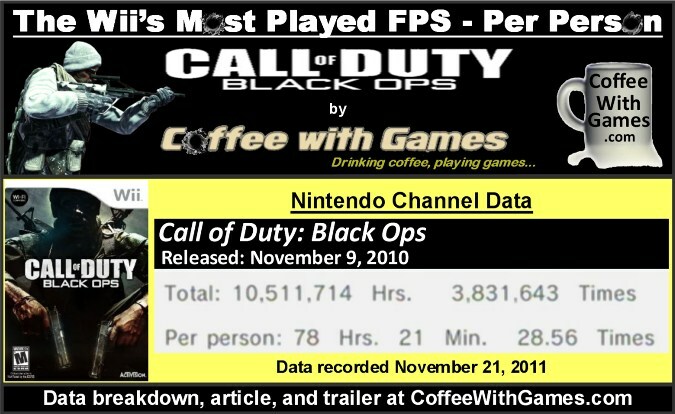 As for the reported data, seeing Call of Duty: Black Ops with more than 10 million "Total Hours" reported in just a year, I believe is absolutely incredible for a Wii FPS. Black Ops already has 2/3rds of the "Total Hours" reported that Call of Duty: World at War has on the Wii, and World at War had a 2 year head-start. Not only do the reported 78 Hours 21 Minutes "Per person" make Black Ops the most played Wii FPS per person and/or Wii console, but those hours put Black Ops in the Top 10 "most played" Wii games "Per person" as well. Again, this has happened in only a year. If Call of Duty: World at War's and Call of Duty: Black Ops' reported game-play hours don't show third party developers that the Wii has a FPS audience, and one that really enjoys the genre, I don't know what will at this point. Do any of you play Call of Duty: Black Ops on a regular basis? If so, which version do you play? If you are playing the Wii version, have you enjoyed the Zombie mode in the online multiplayer? My son still plays all of the time - Zombie Mode on PS3 is the primary. I do still do some multiplayer, but infrequently. Sadly, I didn't play much of Black Ops this year. I enjoyed it greatly last year when we were visiting family in March, but after that it was back to school, work, new baby, school, etc. I played the Zombie Mode a lot in World at War, but not so much in Black Ops. Modern Warfare 3 doesn't have a "Zombie Mode" per se, but it does have a Spec Ops mode which consists of wave, after wave of enemy types. I have played a few rounds on the Wii, but the Spec Ops is the harder mode to find matches in.